Fits: 1986-'16 HD® big twins. Kit contains 2 front and 2 rear rocker arms. Extremely durable rollers reduce valve stem side thrusting with high lift cams. Superior wear and fatigue resistance even in the most demanding applications. 3⁄4" long bushings provide 50% more bushing support area than 1⁄2" long bushings. Available in stock 1.625:1 ratio or performance 1.725:1 ratio. Adjustable pushrods must be used with S&S roller rocker arms to obtain proper valve clearance. New rocker arm shafts are recommended for maximum performance and rocker life. 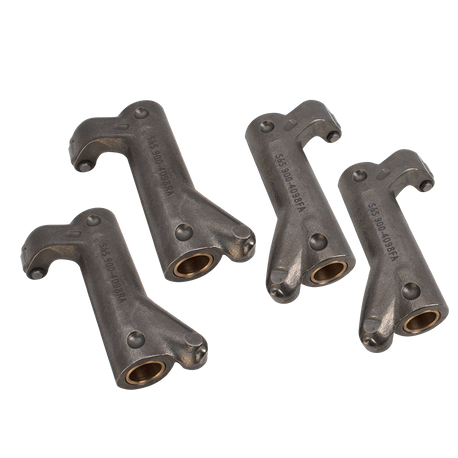 S&S roller rocker arms are recommended for use with cams having more than 0.585" of lift. Adjustable pushrods must be used with S&S roller rocker arms to obtain proper valve clearance. New rocker arm shafts are recommended for maximum performance and rocker life. All reference to H-D® part numbers is for identification purposes only. We in no way are implying that any of S&S Cycle’s products are original equipment parts or that they are equivalent to the corresponding H-D® part number shown.